Volkswagen's redesigned Jetta helped the German mass-market brand accomplish an almost impossible feat: Its overall U.S. sedan sales actually grew by 7.4 percent over the last two months compared with the same period a year earlier. Now, Volkswagen will test the sales power of the new Jetta design by adding more horsepower with a sixth generation of the Jetta GLI. The 2019 Volkswagen Jetta GLI — shown Thursday at the Chicago Auto Show and set to arrive in U.S. dealerships this spring — features a 2.0-liter turbocharged inline-four engine that generates 228 hp and 258 pound-feet of torque, instead of the Jetta's usual 147-hp 1.4-liter turbocharged inline-four. "Volkswagen has long been synonymous with small, sporty cars," Volkswagen Group of America CEO Scott Keogh said in a statement. "The redesigned 2019 Jetta proved once more that its combination of design, technology and value continues to resonate with buyers. 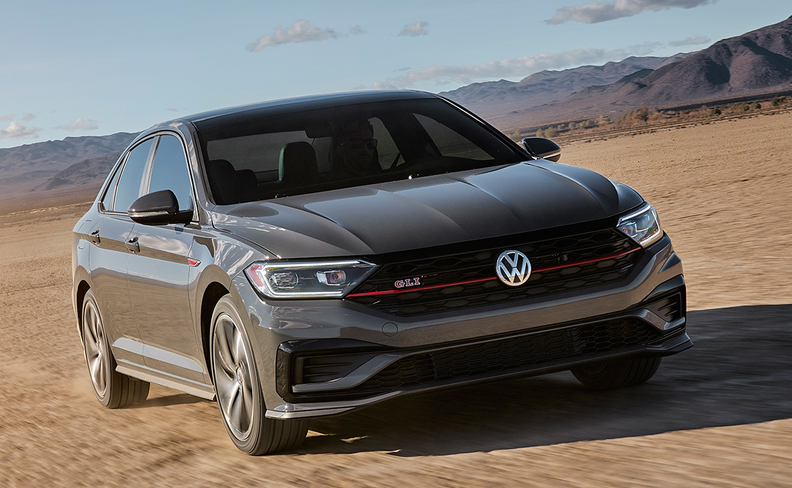 The 2019 GLI takes the Jetta foundation and adds performance features from the Golf GTI to give buyers a true sport sedan." With a limited slip differential, improved brakes, and a multilink independent rear suspension, the Jetta GLI is outfitted for aggressive driving, and it looks the part with standard LED lighting, 18-inch aluminum alloy wheels, a rear spoiler, black honeycomb grille and dual chrome exhaust. The Jetta was redesigned onto Volkswagen's global MQB modular architecture for the 2018 model year. The 2019 Jetta GLI takes full advantage of that new architecture, sitting a little over a half inch lower than a standard Jetta. On the exterior, LED taillights, a rear spoiler and a finned diffuser on the rear bumper give the 2019 Jetta GLI a distinctive appearance from the rear. The black interior is accented in red stitching throughout. The base model is equipped with cloth seats, while the upgraded Autobahn trim features perforated leather seats. A 35th Anniversary model features unique black wheels with a red stripe, a black roof, black mirror caps, black tail spoiler and 35th anniversary badging inside and out, along with unique seat tags, floor mats and sill kick plates. The 2019 Jetta GLI's engine — the same as in the popular Golf GTI — has added 18 more hp and an additional 41 pound-feet of torque over the previous generation, and it features variable valve timing on the intake and exhaust, and variable exhaust valve lift. A six-speed manual transmission is standard, while an available seven-speed dual-clutch automatic comes standard with a fuel-saving stop-start system. An onboard driving mode selector allows the driver to customize the vehicle's dynamics and includes sport, eco and custom modes to augment a normal mode. The 2019 Jetta GLI picks up a number of attributes from the redesigned Jetta, including its App-Connect infotainment system and Volkswagen's optional Digital Cockpit display in the instrument cluster. In terms of safety equipment, the GLI comes standard with forward-collision warning and front-assist braking, blind-spot monitor, rear-traffic alert and automated post-collision braking. Pricing for the 2019 Volkswagen Jetta GLI was not announced.